* If you’re already a triathlete, but a weak swimmer, you can make swimming the best part of your race. * If you have no triathlon ambitions, but would simply like to be able to swim with unimagined ease, confidence and satisfaction, you can. Triathlon is no longer the province of hard-core athletes; it has become the favored challenge for those raising their sights from recreational fitness to something more ambitious. This year over 300,000 people will toe the starting line for races across the U.S.. For most of its 20-year history, triathlon has been male-dominated, but its appeal is growing dramatically among women: Last year, four of the six best-attended races in the U.S. were Danskin events, a series intended mainly for women who are first-timers. If there’s one barrier to even more people doing a triathlon, it’s the intimidating open-water distance swim that opens each race. Swimming a quarter-mile (even in a "sprint" triathlons – "Olympic distance" triathlons start with a mile swim) far from the security of pool walls and lane lines is a daunting prospect. And though triathlon vets may be surviving their "trial by water," the great majority remain hugely frustrated by it. As one said, "No matter how long or hard I swim, I never seem to improve beyond a level I call ‘terminal mediocrity’." With the release of his latest book, best-selling swim writer and teacher, Terry Laughlin promises to end that frustration and to make triathlon a reality for anyone who can run or ride a bicycle. And what he advocates is likely to be eye-opening news – that triathletes will be far more successful at swimming if they don’t train like competitive swimmers, nor should they train as they do for running and cycling. As he explains, the secret to swimming well is to practice it as a skill sport or movement art – not unlike dance or martial arts. Laughlin’s two previous books became the world’s most popular "how-to" books on swimming because they prescribed simple, clear and immediately useful methods of swimming much better — techniques that readers discovered made an immediate and dramatic difference. 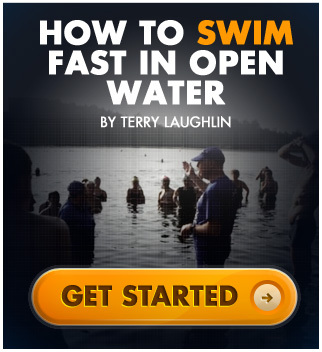 TSME offers similar practical guidance and understanding for what Laughlin describes as a unique form of swimming — open-water and triathlon swimming. Part 1 Why Swimming Frustrates You outlines triathletes’ nearly universal conundrum: They instinctively train for swimming, by doing what works in running and cycling – more miles – but get nowhere. Because humans are hard-wired to be inefficient in water, more laps just make your "struggling skills" more permanent. A triathlete’s first goal should be to swim easier, not faster, because improvement comes far more quickly to those who focus on movement economy than on laps and more laps. Laughlin also describes three mistakes made by every "human swimmer" and a 5-step process for correcting them. * Water is a Wall. What limits how fast or far you can swim? Water resistance, not your strength or fitness. No amount of training can compensate for the drag created by poor body position or an inefficient stroke. Swim farther and faster by minimizing drag and turbulence. * Can slower strokes make you faster? Instinct tells us to swim faster by churning our arms faster, but all that does is create turbulence and make us tired faster. The world’s best swimmers are faster because their strokes are MUCH longer (i.e. they travel much farther during each stroke cycle) than lesser swimmers. So focus on Stroke Length, not on moving your arms faster. * No more sinking feeling. Survival instincts make us want to stay on top of the water…something our bodies are not designed to do. While you think your pulling and kicking is moving you forward, in reality, most of your energy is probably going into "not sinking." (We see that in underwater video of 98% of swimmers.) Learning balance frees you to move far more efficiently. * Swim "taller;" swim easier. Most swimmers use their hands mainly to push water back. But the most advantageous thing you can do with your hands is use them to lengthen your bodyline because a longer bodyline reduces drag. Everything that matters in your stroke happens in front of your head. * Kicking is over-rated. Virtually everyone thinks a powerful kick is the key to swimming well — and do countless laps on kickboards working toward it. But the most important thing your legs do is help your body rotate and kickboard training is utterly useless for that. Teach your legs to work more effectively by practicing drills that employ and improve body rotation. Part 3, The School for Fishlike Swimming, builds on the knowledge base developed in Part 2, by guiding the reader through four Total Immersion "swim lessons" specially designed for self-study, with detailed instructions and dozens of photos. As the fundamental rule for success is "Avoid practicing movements you can’t perform correctly," the learning sequence begins with simple movements and positions and progresses by small steps to the whole stroke. The skill drills are supplemented by frequent sidebars on how to learn more effectively. Part 4, Smart Swimming for the Rest of Your Life, explains how to transform mindless, boring "workouts" into smart, effective — and enjoyable —"practices" that reinforce the skills developed in Part 3, even as they build the right kind of fitness. As Laughlin explains, swimming endurance should be defined as "the ability to swim efficiently for a distance and speed of your choosing." He then explains exactly how to get it. Chapters are also dedicated to preparing for a long well-paced swim, or a short, faster swim and to dryland training that will help prevent injury and allow you to use your body optimally. Part V, Getting Ready to Race prepares readers to put their skills and practice to the ultimate test. From dress rehearsal (how to use a wetsuit to advantage), to purposeful practice when you swim in open water rather than the pool, to everything you should do on race day, from the moment you arrive at the race site to warming up, to swimming the race itself. A bonus chapter, the Afterword, explains the mysterious process through which something that was once difficult becomes easier and more pleasurable through practice and shows readers how to apply the lessons of Mastery in their swimming practice to develop habits and attitudes that increase potential in many other areas.